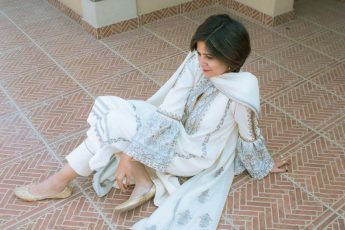 Nourhan Lawn by Gohar textiles recently launched their SS’17 collection nationwide. We have checked out all their prints and hence chose to talk about some of our favorites. The contemporary designs, vivid patterns and detail embroidered necklines gives us the liberty to stitch it the way we fancy. We love experimenting and therefore are always eager to try out new trends and silhouettes complimenting our personality. This year’s collection is feminine and colorful featuring some exquisite ethnic motifs with silk finish dupattas perfect wear for summers. It also signifies individuality, celebrates independence and embodies self confidence which is reflected in their collection. Light hued shirt with a gorgeous contrast of colorful floral embroidered patches on Daman. Paired with a plain white trouser and an elaborate silk dupatta in shades of red and green is an ideal combination in summers.